“I said I learned a lot of things from movies,” he recalled of his conversation with the Lakers star. “I learned how to make a speech from the movie called 'The Bodyguard' -- Whitney Houston. When she sings the songs I look at her and say, 'Wow, that is the way you make a speech.'" Those first two paragraphs are a direct quote, from this article, published in the LA Times. 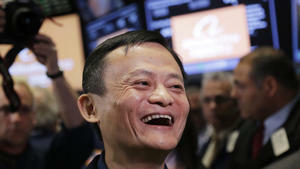 Jack Ma is the founder of Alibaba - the largest IPO ever. We can all learn something from the movies. Everyone can learn to make a speech, too; right, Toastmasters? October 28, 2014 by Brian Rouley.